and thought "yup...yet another wide congested streets, endless rows of big box stores and uninspiring neighborhoods of cookie cutter houses...."
Our preconceptions were challenged however by the concepts of Thomas Seiverts. Following his lecture, we decided to join Thomas and Boris (his son), Matthew Stadler of suddenly.org, and a good size group of strangers in the city of Burien for a neighborhood walk as a textbook example of how we can begin to rethink the aesthetics of urban sprawl. 1. 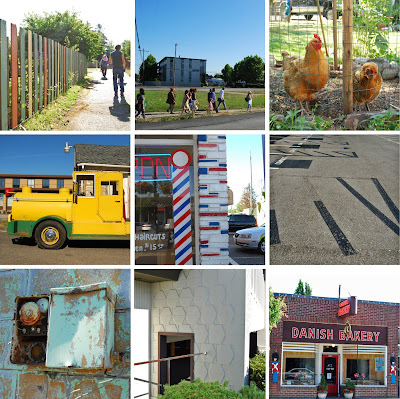 Alleys: According to a member of our group, many of Burien's alleys were created early in its settlement...the more streets the town appeared to have, the more enticing it was to railway development. In modern times, unassuming alleys in the town are bustling with the activities of mixed-shared use. A central alley off the main street houses the back side of commercial areas: restaurant workers hanging out on break and the olde feed store's garage door open to reveal surprise chickens and haystacks. As the alley continued into the residential area, people customized their spaces without fencing off their property revealing beautiful gardens (with more chickens! ), backyard bbq's, and abandoned backyard projects. You rarely think to walk down alleys, but they are really visually rich areas. 2. Repetition towards "Aesthetics": One of the big themes in Sievert's theories is the inhabitant's tendency towards adding aesthetic elements to make the landscape their own. One of our most striking observations of this is that there was lots of repetition in the Burien cityscape: newer "more attractive" traffic lights were being put up directly next to perfectly good utilitarian ones, boring signs were repeated with brightly colored versions of the same thing, better looking fences were put up directly in front of less desirable, but effective counterparts. People definitely have the natural urge to beautify their space, we just need to be more deliberate about allowing that to happen. 3. Original Character: Burien has a pretty sweet downtown strip. Not only are there tastefully done new condos and retail shops going up (including a great coffee shop called Burien Press) but there are plenty of un-gentrified quaint shops and cafes(Kirk's feed, old time patriotic barber shop) and original 1950's main street architecture (many vacant but formerly home to jewelry stores and trophy shops) that add to it's charm and history. 4. 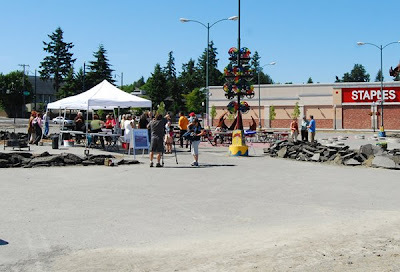 Unpretenous art scene: The city tour began and ended at the Burien Interim Art Space (B/IAS), which is a temporary public art space created in an empty parking lot outside of the Staples super store. The area was slatted for development, but as the project was put on hold the community banded together and convinced the builder to allow it to be a temporary open-air art space. In between artfully carved up asphalt (the parking lot was selectively broken up to reveal the dirt below) B/IAS houses several burning man sculptures plus a small pea patch! There is also the Burien Arts Gallery situated in a lovely small house above Burien Park, which is beginning to break ties with it's seascape-watercolor-painting past and bring in contemporary works from Seattle and beyond. 5. Unafraid of Fine Dining In a Staple's Parking lot: Burien appears almost unapologetic about it's identity, which is impressive in its own right. While it has some developed character, it is mixed bittersweet with soulless big box stores, roaring traffic, and run-down fringes. The city wears it all well and according to Sievert's ideas is well poised to gracefully accept a future of increased localization and need for community resourcefulness. We were just happy to be there to witness what it has to offer here and now and to enjoy a great conversation and a delicious (and free!) meal in looming shadow of Staples. All and all, this simple walking tour was an experience that left more than just an impression. We walked away from the tour with new inspirations, new connections, and the feeling of optimism. Pretty amazing for a suburb town. 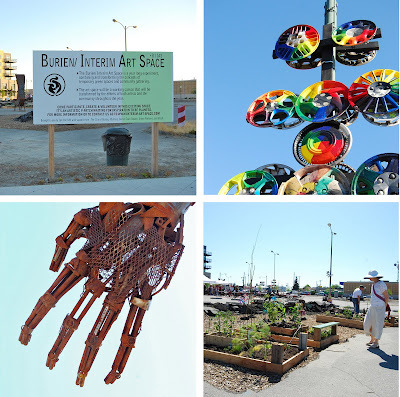 Next time when we're feeling the travel itch, we'll just head down to Burien instead! See more photos and commentary on Flickr.